The Colorado LTAP Center hosts a innovative idea contest every year called “You Show Us”. The contest is very similar to the CT T2 Center’s “Creative Solutions” contest. Colorado’s LTAP Program encourages their state and municipal employees to enter “You Show Us” contest, because it is a profitable way to share their innovative ideas with others that may benefit from their concepts. It is also a good way for individuals, crews and departments to get some well earned recognition for their efforts. It’s a real morale booster for everyone! 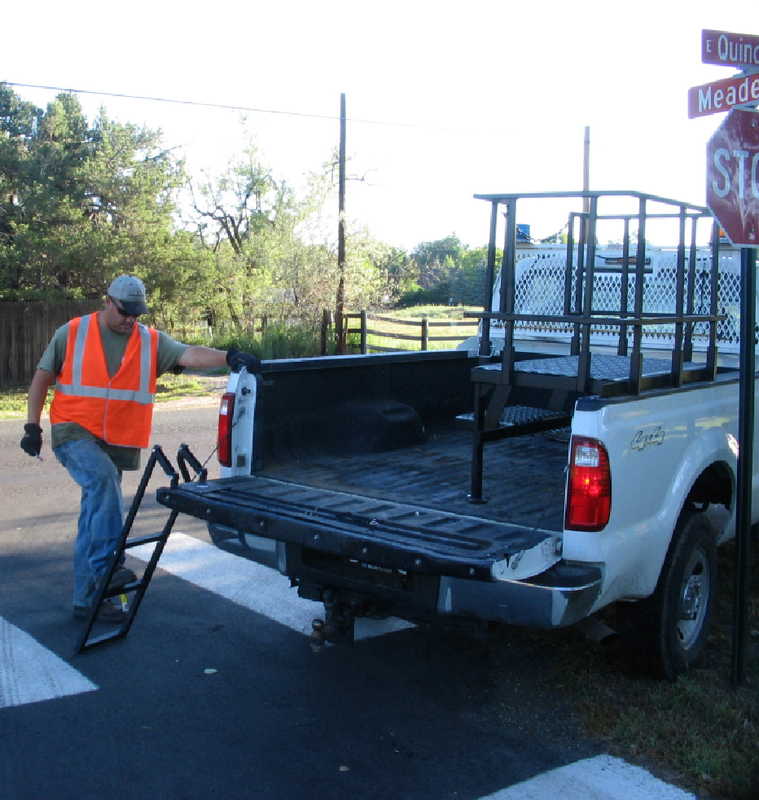 Two of the Street Department’s many tasks includes maintaining all of the City’s information and regulatory signage (name signs, speed limits, stops, etc.) and low to the ground right-of-way tree trimming around signage and other structures. Unfortunately the City is not resourced with a vehicle (bucket truck) specifically designed for these duties. As a result, they would end up with somebody standing in the back of a pickup truck or climbing a ladder to these low to the ground maintenance repairs. Climbing a ladder always represents a risk factor, especially on uneven rights-of-way, during all weather conditions. It was also felt that climbing in and out of a pickup bed, while doing repairs was too great a risk for staff members to continue doing. A new truck mounted with the appropriate attachments and safety protection, was not a feasible option. The agency needed a low budget solution that was both practical and safe. The Street Department is fortunate to have a Crew Leader that is very knowledgeable in a the area of steel fabrication. When faced with the task of building some kind of sign repair stand, it was desired to find a low cost solution that that would fit in the bed of a pickup, be easily installed or removed by two crew members, and provide the safety measures needed for personnel doing repairs. The Crew Leader talked with other crew members and quickly came up with a successful design. The final design required the purchase of square tubing, angle iron, flat bar, chain and clip, grip strut, and black paint with primer. Some of the materials the City already had on hand from previous projects. The cost for all materials totaled around $300. The equipment used for construction of the sing stand included a gas torch, mig weder, metal blade chopsaw, drill press, hand drill, and grinder. The City owns all the power tools that were needed for the construction of the stand, therefore the cost for tools was very minimal, estimated at around $20. Twenty hours were spent manufacturing the stand from the beginning to end. This time frame included purchasing all the materials, sizing and fabrication, priming and painting, and installation of the stand. No overtime was needed to construct the stand, therefore no additional labor costs were incurred. The City did purchased the tailgate ladder online, that mounts to the inside of the tailgate of the truck, at a cost of $60. Having knowledgeable manpower, all power tools needed, and budgeted time, the City feels it saved in the neighborhood of $2,000 on this project. Professional welding fees alone could have exceeded these costs. Of far more importance to the City than savings was the tremendous increase in safety for its street personnel. With a tailgate ladder to enter and exit the bed of the truck, nobody has to climb over a tailgate. The sign stand has a railing at just below waist level, allowing a worker to reach beyond the edge of the truck. The grip strut decking allows for sure footing while inside the stand and on the step when entering and leaving. There is a safety chain to close off the entrance to the stand to eliminate accidentally falling out backwards. The stand is bolted to the truck body to prevent it from moving when in use. The stand also elevates the worker an additional two feet from the pickup bed floor, allowing an expanded work area without having to do dangerous reaching for signage or tree limbs.